Designed to accompany McKay et al.’s A History of World Societies, each chapter of Sources of World Societies contains approximately five sources, both textual and visual, that present history from the perspectives of well-known figures and ordinary individuals alike. Headnotes and questions supplement each document, while a "Viewpoints" feature highlights two or three sources per chapter that address a single topic from different perspectives. Comparative questions ask students to make connections between sources and across time. 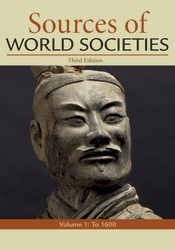 Sources of World Societies is FREE when packaged with A History of World Societies, and is included for FREE in the LaunchPad for A History of World Societies.